Hyundai sold more than 31,000 i30s in Europe during the first quarter. SEOUL (Bloomberg) -- Hyundai Motor Co., South Korea's largest automaker, said quarterly profit jumped fivefold to a record after an economic recovery and new models spurred demand. Net income rose to 1.13 trillion won ($1 billion) in the three months ended March 31, from 225 billion won a year earlier, the Seoul-based carmaker said in a statement today. That compares with the 790.3 billion won average of 26 analyst estimates compiled by Bloomberg. Sales gained 40 percent to 8.42 trillion won. The automaker said revamped Sonata sedans and Tucson SUVs lured buyers, helping raise first-quarter vehicle sales 26 percent from a year earlier to 825,100 units. In Europe, Hyundai's Q1 sales rose 24 percent to 100,758 units, the most sold in a single quarter since it started importing cars to the region in 1978, the company said. 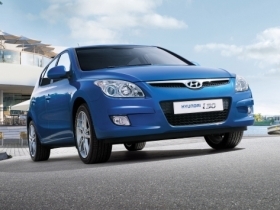 Hyundai was helped by strong sales of i30 compact, which reached a volume of more than 31,000 units in the quarter. Hyundai also benefited as a strengthening yen hampered Toyota Motor Corp. and Honda Motor Co. in export markets where they compete with the South Korean automaker. Hyundai rose 0.4 percent to close at 125,500 won in Seoul trading, compared with the Kospi index's 0.5 percent drop. The stock has advanced 3.7 percent this year after more than tripling in 2009. Operating profit surged more than fourfold to 702.7 billion won from 153.8 billion won, the statement said. The company's factories in China and India as well as other affiliates boosted net income in the past quarter, Hyundai said in the statement. Affiliates contributed 514 billion won to profit in the past quarter compared with a 15 billion won loss a year earlier, Hyundai said. Hyundai's global market share for the quarter was 4.8 percent, up from 4.7 percent a year earlier. Retail sales in its home market increased 30 percent, as the Sonata sedan became the best-selling car in South Korea. In the U.S., the carmaker raised sales 16 percent in line with the overall industry demand, giving it a market share of 4.4 percent, according to Hyundai. Sales at Toyota climbed 7.2 percent after the automaker recalled more than 8 million vehicles worldwide for defects that may cause unintended acceleration. Sales in India jumped 38 percent while retail deliveries in China increased 9.9 percent to 123,487 vehicles. Hyundai also benefited from higher car prices, analysts said. The carmaker increased its average selling price per vehicle 11 percent in South Korea, its most profitable market, according to Yim Eun Young, an analyst at Dongbu Securities Co. in Seoul. The average selling price of cars exported from South Korea rose 13 percent. Hyundai maintained market share in the U.S. while cutting incentives there to $1,750 per vehicle in the past quarter, the lowest level since 2003, Yim said. “We expect Toyota to maintain aggressive incentive policies for the time being,” Lee Won Hee, Hyundai's chief financial officer told reporters today in Seoul. “Still, we don't plan to follow the suit. Rather, we'll increase marketing programs to increase brand value,” he said. The yen has strengthened 5 percent against the dollar over the past year and is 22 percent higher than three years ago, weighing on Hyundai rivals Toyota, Honda and Nissan Motor Co. Hyundai expects the won's appreciation against other currencies to be “limited,” CFO Lee said today.